where X is a noncentral χ2 random variable with v1 degrees of freedom and non-centrality parameter λ, and Y is a central χ2 random variable with v2 degrees of freedom. Constructs a non-central beta distribution with parameters v1 and v2 and non-centrality parameter lambda. Requires v1 > 0, v2 > 0 and lambda >= 0, otherwise calls domain_error. Returns the parameter v1 from which this object was constructed. Returns the parameter v2 from which this object was constructed. Returns the non-centrality parameter lambda from which this object was constructed. The domain of the random variable is [0, +∞]. This distribution is implemented in terms of the Noncentral Beta Distribution: refer to that distribution for accuracy data. Since this distribution is implemented by adapting another distribution, the tests consist of basic sanity checks computed by the R-2.5.1 Math library statistical package and its pbeta and dbeta functions. 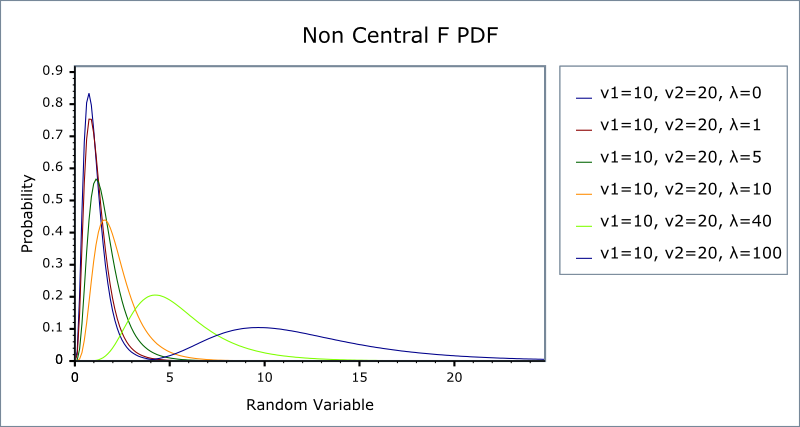 In the following table v1 and v2 are the first and second degrees of freedom parameters of the distribution, λ is the non-centrality parameter, x is the random variate, p is the probability, and q = 1-p.
is the noncentral beta quantile. is the noncentral beta quantile from the complement. By numeric maximalisation of the PDF. Refer to, Weisstein, Eric W. "Noncentral F-Distribution." From MathWorld--A Wolfram Web Resource. Andrea van Aubel & Wolfgang Gawronski, Applied Mathematics and Computation, 141 (2003) 3-12.